Seek God. Serve Others. Share Life! S L Y Visit the SLY website at http://www.slymemphis.org for tons of up-to-date information on upcoming events, confirmation lessons, and to get to know who we are as the St. Luke Youth! 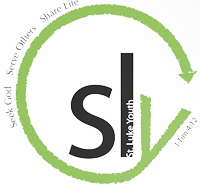 This ministry includes 5th-12th grade students gathering together as part of St. Luke Lutheran Church in Cordova, TN. And we are on fire for what God is doing in our church, our community, and our world! Our Vision is simple: Seek God. Serve Others. Share Life! "Don't let anyone look down on you because you are young, but set an example for the believers in speech, in conduct, in love, in faith, and in purity."